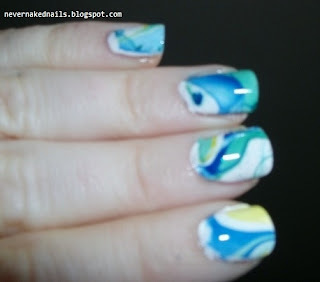 If you've been keeping up with either my blog or Cuti-Clue-Les' (whom btw has totally redone her background recently and it looks awesooome) then you will know that I have just discovered a new love: water marbles. Oh my god. 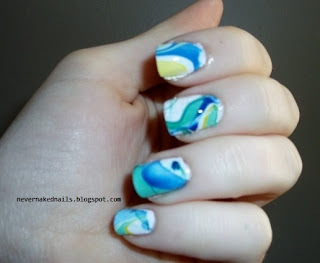 I think I could do water marbles forever and ever, and never get tired of them! For color inspiration, because I always feel like I'll throw together something awful, I look to fashion magazines. Yeah. I read 'em. So what? Anyway, the writers/staff at these mags might not know exactly how I feel on every subject, especially my stance on being submissive to men, (sometimes Cosmo, I really do love ya, other times I feel like you're trying to subliminally message me into becoming an oral machine..) and the fashion stuff is always craaaaazy expensive and normally just impractical for my life. I don't work on a runway! But they're normally pretty good at puttin' colors together=] I swear, since my nails became my obsession, magazines have just become these idea books for me, they're also really great for patterns and designs. Anyway, so I got this month's Marie Claire, and found a page with a girl wearing this weird peacock dress. It had all of the peacock-ish colors and a couple feather designs I think, but mostly the colors were just there all together, swirled and going in different directions.. I thought that would be cool to recreate! Everyone is loving the peacock design right now, put your own spin on it if you're interested but kind of unsure! Some of these are still blurry, sorry! I promise I got my camera issues fixed, but these were taken the other day.. 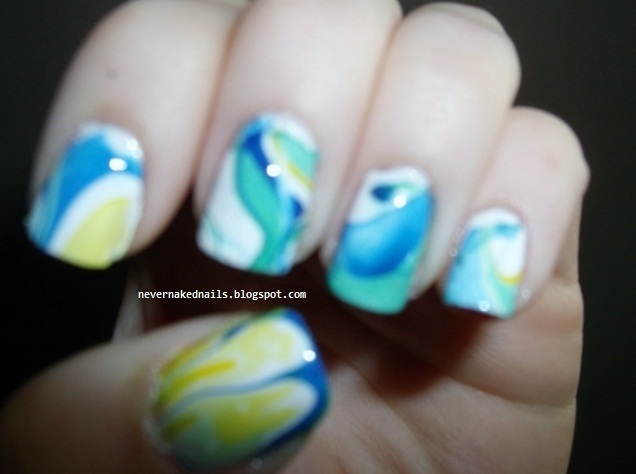 Anyway, I started with a base of Maybelline Color Show Porcelain party, then did my marble with Pure Ice French Kiss, Maybelline Color Show Tenacious Teal and Kleancolor Neon Yellow, as well as Finger Paints Art You Wondering, which didn't show up so much in pictures. 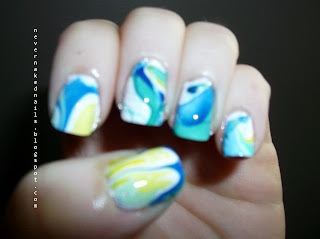 I really just love marbles now, they're so fun and easy! Once you have your colors, you're good to go! 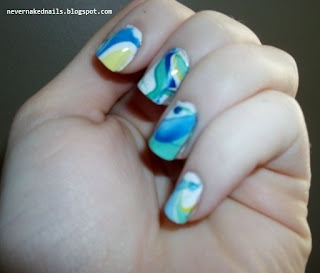 I use the tape method, so clean up is a breeze, and I get better with each one I do! If you have been put off by a marble mani, or are unsure of whether or not to try one because of maybe things you might have read about them or whatever...don't be! Practice is the only way to get better. Basically what it comes down to is, if I can do it, then there's gotta be a way that you can do it too. If you have any questions at all, let me know! Marie claire have Ciate polishes on offer in their next magazine don't they? I haven't checked but I hope so, i'll definitely be buying it if they do! Thank you, and I would try vaseline if i had any.. I have Eucerin Aquaphor, which is about the same consistency, i wonder if that would work? Hey have you done any marbles yet? you neeeeeeed to! I am totally like you! 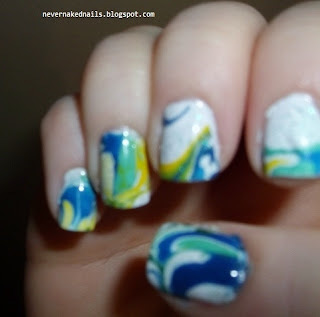 I've fallen in love with water marbling! 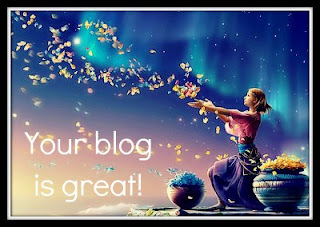 I just did a post on it a couple days ago. So much fun! wow What a nice color selection. I really just love marbles. You make design on your nails look like marble.